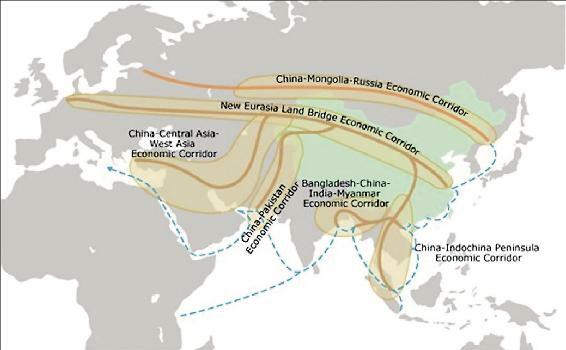 The following is an edited version of a lecture delivered by Chinese author Prof. Zhang Weiwei on July 11 in Berlin, Germany, at an event on the “Belt and Road Initiative (BRI),” sponsored by the German Schiller Institute. The title of Dr. Zhang’s speech was, “The China Model and its Implications.” Dr. Zhang delivered a provocative presentation on the Chinese Development Model, providing insights into the systemic thinking behind the economic and political development of China over the last four decades. Dr. Zhang is the author of a 2012 best-selling book, The China Wave: Rise of a Civilizational State. We reproduce Dr. Zhang’s speech here because of the strategic importance of fostering and expanding an honest “Dialogue of Civilizations” among China, the United States, and other nations. Only such an expanding dialogue can create the basis for trust and cooperation among nations in the coming period. This type of dialogue will be indispensable in bringing nations together around an outlook of war-avoidance and global economic development. Dr. Zhang’s views are his own, and EIR does not necessarily endorse his characterization of either, “western culture” or the political and social realities within the United States, as he presents them. Thank you chair, and thank you, Mme. LaRouche for your kind invitation. It is a great honor to come to the Schiller Institute, to Germany, to present my views on the China model and its possible implications. I will speak for about forty-five minutes, or slightly more, and then eventually we will have questions and answers. 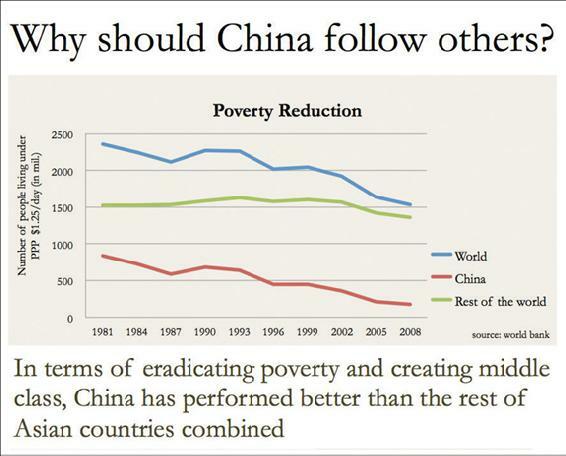 This is a quick slide to show the huge reduction of poverty in China. Actually, 70% of the world’s poverty eradication has occurred in China. In other words, without China’s performance in wiping out poverty, poverty in the world would have actually grown, rather than been reduced. Here are some major indices about China’s rapid development: Roughly over the last three decades and a half, China has been growing at an annual rate of nine percent, trade fifteen percent, per year. China has now become the world’s largest trading nation. Its total GDP, by official exchange rate figures with the U.S. dollar, is almost $11 trillion. What’s more important, if you calculate this by purchasing power parity (PPP), then China is was already an economy larger than the United States three years ago; those are the IMF statistics. China is the largest trading nation, with a $4.3 trillion total annual trade volume, while having lifted 700 million people out of poverty. China is the first developing country to realize, to achieve the United Nations Millennium Development Goal (MDG), which means to halve poverty by the year 2010. China did that a long time ago. And China also has the world’s largest foreign exchange reserves, which means that China’s foreign exchange reserves alone are now larger than the combined economies of the former Socialist countries, including Russia, the Central Asian Republics, and the Eastern and Central European countries—larger than their GDP put together, the foreign exchange reserves alone. Last year, China exported more tourists than any other country—135 million visits made abroad, which means that China has produced the world’s largest middle class. This is by international law standards, which means you hold a passport and go abroad. China’s a huge country. Flying from Beijing to Shanghai, covers the equivalent of ten European countries. Virtually all those who can afford air travel in China, all those who can ride high-speed trains, are those who can afford to go abroad. What’s more important is that most Chinese are optimistic about the future of their country— this is very important—and also about the future of their own lives and their families. So this is very encouraging. 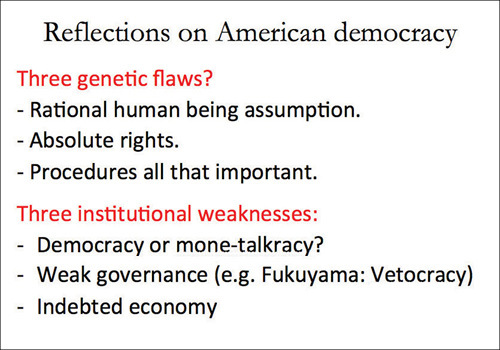 And then, Fukuyama and I discussed political reforms in China and in the United States. He said, “Yes, there are a lot of problems in the U.S. political system, but,” he said, “it’s a mature political system. It can fix its own problems.” I replied, “I doubt it.” I said, “Your political system is a product of the pre-industrial era, when the U.S. had a population of slightly less than three million.” “So,” I said, “you have to go through substantial reform.” I made another prediction, which was also accurate, “Without such reform, my concern is your next President may be worse off than George W. Bush.” And today, I guess, most Americans may share this view; for sure, most Europeans will share this view given the Trump phenomenon. And then I said, number three, “It’s not the end of history, but the end of the end of history.” And I explained why to him. Of course, one major reason is the rise of China, which I call a civilizational state, in that it has its own logic, different from other countries. Let’s start with “for the people” first. This is a slide to show the increase of the wealth of the Chinese people, and the decline of the wealth of American families. Look at household net assets. 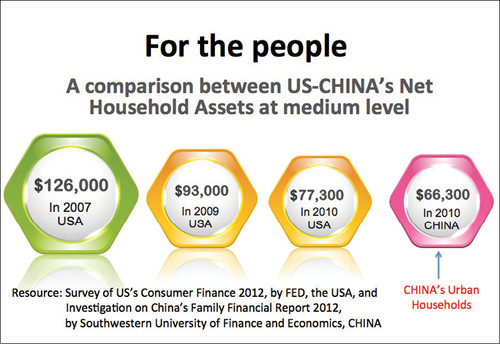 The gap between Chinese families and U.S. families is roughly only 10,000 U.S. dollars. It’s unbelievable, but it’s true. This is a Pew Center survey, which shows that most Chinese are optimistic about their country’s future, and are satisfied with the direction of their country. 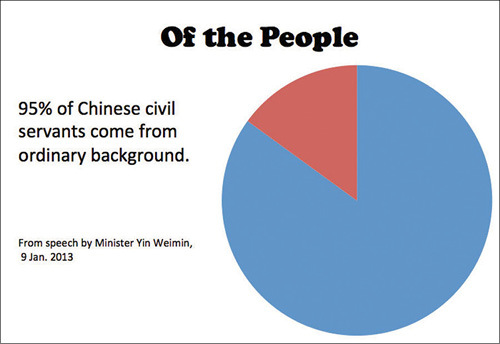 In China, it’s 87%, in the U.S.A. 37%. And this is the latest one, by Ipsos, U.K., one of the largest opinion survey companies. They ask whether the citizens of their countries consider their countries are on the right track: in the case of China, it’s 90%; in the case of United States, 35%. I don’t know why in the case of Germany, it’s pretty low—it’s 32%! But that’s Ipsos’ survey; maybe by this time, half a year later, it’s already different. But anyway, you see the result of this survey. So, the above, as I said, is “for the people,” where China has done arguably better than the United States. “Of the people”: If we look at civil servants, the composition of civil service officials, in the case of China, 95% of Chinese civil servants come from very ordinary families. So we see the People’s Republic is made up of ordinary people; this is technically true as well for the Chinese government. For the United States, Professor Stiglitz of Columbia University, Economics Nobel Prize Laureate, famously said, “the United States today is of the one percent, by the one percent, for the one percent.” This line has been widely quoted in the media. Now, actually the dispute comes with this “by the people.” So what is, really, “by the people?” In the West, in Germany as well, democracy is widely associated with very simple procedural democracy—one person, one vote, plus a multiparty system, and regular elections and rotation of governments. Yet, we find that in many countries, Western democracy is,— there is this phenomenon called, “elect and then regret.” If we look at the Brexit in the U.K., if you look at the U.S. election last year, and we look at opinion surveys about the U.S. Congress, its approval rate is something around 10%. So here there is a contrast. The Western approach of democracy is focused on what’s called “procedural democracy”—procedurally that’s correct, it is democracy. The Chinese approach it differently: China says, let’s first look at substance. So what’s the objective of democracy?—then, try to explore what are the best ways and means to achieve this end, and this is the essence of democracy. So we have conducted wide, extensive experiments—I’ll come to that. I call this a paradigm shift from what’s called “democracy vs autocracy,” to “good governance vs bad governance.” In other words, democracy at the level of substance, should be good governance. For the top leadership in China today, we have what’s called the members of the Standing Committee of the Political Bureau. The minimum requirement is having served two terms as a governor of a Chinese province, which means, at minimum, since China is the world’s most populous country, you have to have already governed 100 million people before you become one of the top seven. In the case of Xi Jinping, he actually managed three provinces, Fujian, Zhejiang and Shanghai. The internal population is 120 million. In terms of the size of the economy, it’s larger than India—all before he became a member of the Standing Committee. Then he was given another five years in this particular membership, to get familiar with national affairs, affairs at the national level, and then became the top leader, the President. So, I think this is the most competitive system in the world! I joked with Professor Fukuyama, I said, “with the Chinese meritocracy system, it’s inconceivable, that a weak leader like George W. Bush could come to power.” It’s way below the Chinese bar. And this is what I call the decision-making process. We term it new democratic centralism. Actually, democratic centralism originated with the Soviet Union. Eventually it became more centralism than democracy. But China turned this process, really, changed it completely. It’s really an institutionalized decision-making process. Essentially, it’s what we call “from the people, to the people,” the first round; “to the people, from the people,” another round; “from the people, to the people, again.” You go through several rounds of consultations and in the end you reach better decisions. 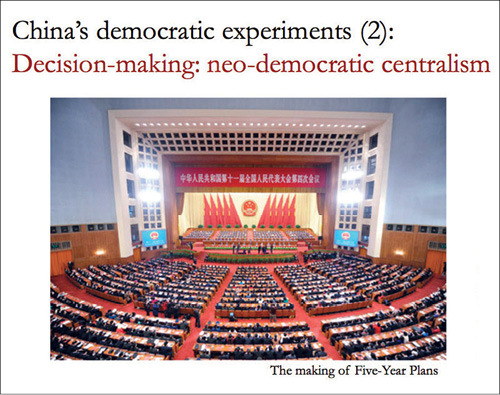 A typical example is China’s Five-Year Plan. Again, it’s a product from the Soviet Union, but China has moved way beyond the Soviet model. It’s not mandatory planning, it’s strategic-indicative planning; it’s the orientation of the country, orientation of the economy, orientation of social development. For instance, China made a decision five years ago to make renewable energy a strategic sector. So now China is the leader in renewable energies, whether solar power, wind power, or electric cars—China is the leader in terms of investment and output. 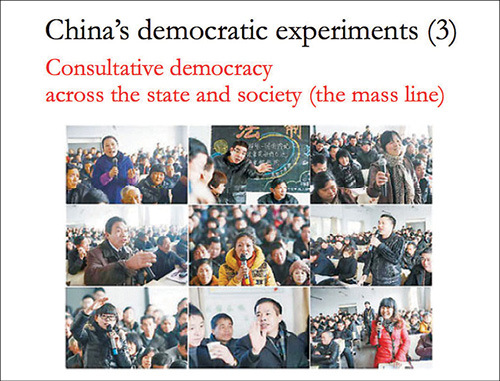 But this same process goes through hundreds of rounds of discussions at different levels of Chinese government and society, with input from many, many think-tanks. In the end, we reach consensus. So it’s very different from the American model which is decisions by a small circle who then try to sell that to the public. We don’t need to sell it. This legitimacy of the decision-making process is much stronger than in the American practice. And then we have, at the grass roots level, what we call consultative democracy, across the state and society. In the West, essentially, democracy is confined to regular elections in the political domain, about who will become the next leader. In the case of China, it’s really a part of social life. For instance, in my university, my institute, we have a union which will casts votes on the performance of the director, deputy director, and secretary general. We do this once a year. You want to promote, say, middle-level cadre—we did that just last month; then you have a list of all of those who are qualified, you have opinion surveys for all of them, all the professors, associate professors, and lecturers. This is what’s called the “mass line” in the official jargon. 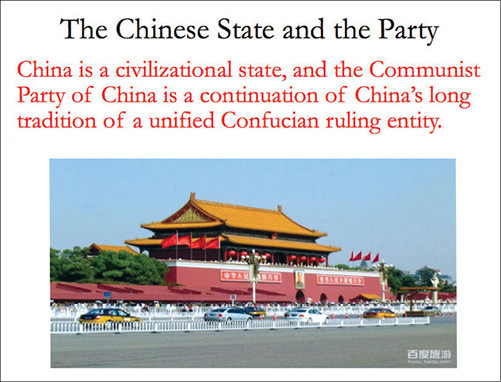 Now, what’s more fundamental, is how to understand the Chinese state. I described the Chinese state as a civilizational state. What does that mean? China is unique: China is the world’s longest continuous civilization. And this civilization is amalgamated with a super-large modern state. It’s actually made up of hundreds of states made into one. I once said, more or less accurately: if you are familiar with China, you can observe the way of life and mentality of a typical person from Shanghai, a typical Pekinese, a typical Cantonese—three major cities in China. The differences between these three groups of people are actually wider and greater than among a typical German, Frenchman and Englishman—even to their language, their dialects, and internal pronunciation. The gap is bigger than between German and English, or French—but we have the same written language, and this is important. So the Chinese are not just one state— like Austria—it’s totally different. I will use another phrase; it’s not accurate, but to have a European audience understand, it’s more as if the Roman Empire had continued to this day. People speak their different dialects, but they all use Latin as a written language, and then there is a centralized government, a modern economy, and the world’s largest middle class —something like that. It’s not accurate but it’s a useful analogy. So this kind of state cannot afford today’s Western political system; if you tried this system, the country would break up immediately. Just like the Roman Empire, if it continued today, would break up with the Western political system. For this kind of country, the political tradition of running this kind of country, the political governance or political culture for state-governance or statecraft, is always a unified ruling entity, a united political entity. So the Chinese Communist Party is different from the Republican Party or Democratic Party. Those Western political parties are openly representative of certain groups, and then they compete with each other for election. In the case of China, it is such a huge country. It was first unified in 221 B.C., 2,200 years ago. Ninety-five percent or more of the time, China was under one, unified political entity, the emperor, the court—and this situation continues to this day. So I call the Chinese Communist Party a grand coalition. You have all kinds of different voices, interests, ways, within the party, but you have to reach consensus and move on the consensus. So sometimes, I use another term. As I said, in the West, political parties are openly representative of partial interests, the interests of certain groups: In the case of China, even with its long past, you have to represent so-called “all under Heaven.” If you cannot represent, you have to claim you represent “all under Heaven.” If you claim you represent only part of the society, you cannot come to power at all. This is a very different political tradition. 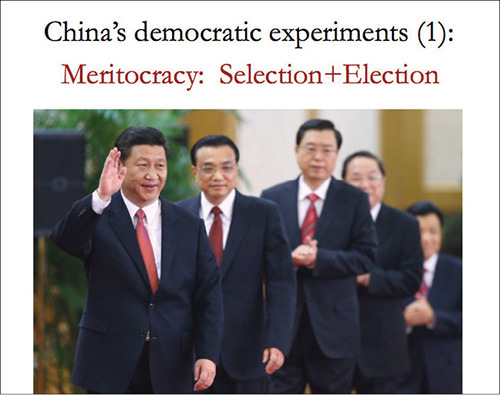 This is my quick summary of the so-called “China model.” And politically, essentially, it’s selection plus election: You have a vigorous process of selection, and then you have a process of election. And you have a unified ruling entity—today it’s called the Communist Party. Many people don’t like this name, especially in the West. For Germany, you have the East Germany experience, but what’s more important is the substance. Some people in the West always think China is nothing but another East Germany, but ten times larger. No—it’s very different. It’s a civilization, a civilizational state, and many traditions continue. In the economic domain, China is a mixed economy. It’s officially called a socialist market economy. In the West, there’s the difference between the continental model, in which the state plays a larger role, versus the Anglo-Saxon model. But in the case of China, you have state ownership of land. We are all property owners, but we have a contract with the state: You own the right to use this piece of land for seventy years, and then it will be renewed. The advantage of this system is China can carry out this larger-scale infrastructure development in the public interest. And then, when I say “mixed economy,” I can give an example. China is now leading the world in mobile phone technology. What’s our objective? We call this, the “fourth industrial revolution”—with one mobile phone you can do everything. For instance, in Shanghai, you don’t need a credit card, you don’t need cash; everything is paid by your mobile phone. It’s already achieved. And today this mobile phone payment in China is already larger than Japan’s GDP. It’s fifty times that in the United States. And behind the mixed economy—China now has a company, you must have heard of it, called Alibaba, of Jack Ma. He invented a shopping festival, shopping spree, Double 11, so 11.11, for Singles. But actually it’s for everyone. So, in the Double 11 festival last year, the one day e-commerce volume was larger than the e-commerce volume of the whole country of India in one year. It’s 120.7 billion yuan, or about $18 billion; it’s larger than India’s e-commerce for the whole year. Jack Ma’s Alibaba is a private company, and it’s doing extremely well. But, I say it’s a mixed economy: The whole logistics, highway, expressways, high-speed trains, this mobile system—4G, 5G—now, 4G already covers the whole country, 99%, and it’s a vast country, all these are done by state-owned companies. It’s indeed a combination of two sectors, the state sector and the private sector. China’s a vast country, and you have many villages in the mountains, but China started a project called the “Hard-Paved Ways to Each and Every Village,” which has been achieved. Power, electricity coverage for the whole nation has been achieved. So all these are done by the state sector. So, indeed, this is mixture of both state sector and private sector. The private sector is extremely dynamic, and then you also have the important role of the state sector. In the social domain, it’s more about interactions between the state and society, rather than—especially as against the American model—society versus state, society against the state is different. Because, in the United States, the tradition is the state is a “necessary evil.” But in the case of China, the state has long been viewed as a necessary virtue. In China’s long history, two major rivers, the Yangtze River and Yellow River, run across much of the country. The two rivers cause regular floods, and we have to control the floods. To control a flood, nationwide coordination is needed; no single province can perform this job. That’s why China has shaped this long tradition of a slightly larger role for the central government. So whatever surveys you do, the central government always enjoys tremendous support among the Chinese public. This is almost always the case. 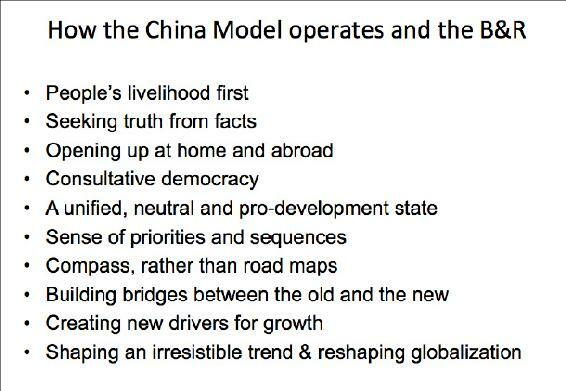 Now, this is important—the philosophy behind Chinese statecraft. Today, we have this issue of “populism,” and in my debate with Professor Fukuyama, I said, “I’m deeply worried about the rise of simple-minded populism in the United States.” He said, with confidence, “even Abraham Lincoln famously said, ‘you can fool some of the people some of the time, but not all of the people all of the time.’ You know, with the free media, with freedom of speech, we can correct these mistakes.” I said, “I’m not that optimistic.” [laughs] I’m being slightly cynical, because I know the United States well. In the end, indeed, populism causes a lot of problems. 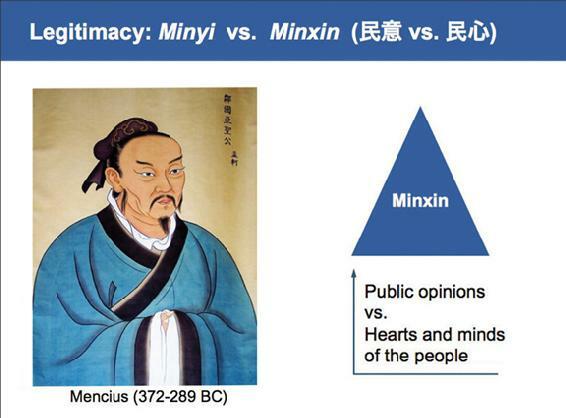 But in Chinese statecraft, this idea of popular opinion is called minyi; and then there is minxin—one has still to find the right translation; I have tried to use the expression “hearts and minds of the people.” In other words, minyi is more or less public opinion; minxin is more about the long-term and overall interest of your nation, or your country. 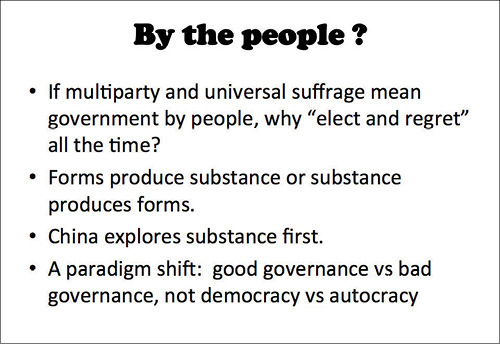 So the governance in China is based on minxin, very importantly. Minyi, or public opinion, could reflect minxin, the “hearts and minds,” the long-term intentions of your country, or could not reflect it—because in the Internet age, in this new social media age, public opinion can shift in minutes or hours. And this is interesting. I just tried to show you a study done by an American scholar: that in the West we hear very often, even in Germany, of so-called “European values,” or “universal values.” This term itself is okay. The point is, to what extent is it really universal? This study was actually the product of the debate about “Asian values” in the 1990s. They suggest that, yes, there are certain values which all peoples of all nations share. 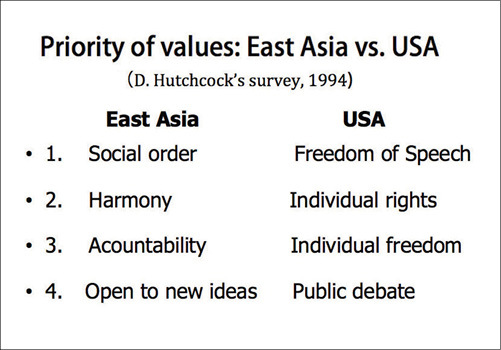 Yet, due to different political and cultural traditions, these values are given different priorities. In the United States, it’s freedom of speech; in East Asia—there is almost no exception—it’s public order. And the reason is very simple, because you have a very large population and you have relatively smaller, per-capita resources. So if there is no social order, it’s chaos. If you ask a Chinese, what do you fear most, he will tell you “chaos.” So this is the key difference. But, always, I share this view with my American friends: I say, do you really have freedom of speech? The United States is such a “politically correct” society! You have so many taboos, far more taboos than China, that you cannot touch upon. But that’s the same with the European countries—even in Germany, as well, you have this problem. That’s my thinking about the American model. In my debate with Fukuyama, I mentioned briefly the problem with the U.S. system, why it’s not the end of history; it’s the end of the end of history, because there are certain things, which are like genetic flaws—one is this assumption that human beings are rational, and this whole idea of one person, one vote based on that! Indeed, with the new social media, you find that increasingly it’s difficult to keep rational and reasoned discussions. In the United States, with the involvement of the money, and then the new social media, you want to be rational? It’s not that easy. And then, rights have become absolute. That’s in Europe as well. Rights, rights, rights! From a humble Chinese view, rights and obligations always go together, otherwise the society cannot operate on a long-term basis. And then, the procedures are always the most important thing. I agree, procedures are very important, but look at the West today, the United States in particular. From my humble observation of the world today, all countries need some kind of reforms, the United States, Germany, European countries, Chinese Taiwan, Hong Kong they all need reforms! But!—Actually, most countries can hardly conduct reform. For one thing, the procedures are so complicated. For instance, if you want to have reform in the United States, you need to revise the Constitution. Actually, it’s impossible to revise the Constitution. As a result you cannot carry out reforms. And then, the issue of weak governance—Fukuyama’s phrase called it a “vetocracy,” different institutions veto each other; then the economy is heavily in debt. Now, this will be an interesting fallout from the China model. I will describe the China model, and how it operates, and then its relation with the Belt and Road Initiative. So I will describe how the model operates in terms of ideas, in terms of the model’s features, and then see their relations with the Belt and Road Initiative. You know that the Chinese President put forward this Belt and Road Initiative four years ago. It’s really about a platform across Eurasia on land and sea routes from China through the South China Sea all the way to the Indian Ocean, South Asia, Africa, Europe, and to Indonesia. So this is a gigantic project, and when it was first put forward four years ago, and even now, it always meets a lot of suspicion in the West. If you look at the Western doubts, or suspicions, they are mainly twofold: One is, China is now an economy with excessive industrial capacity; it wants to export this excessive industrial capacity. This is one interpretation. 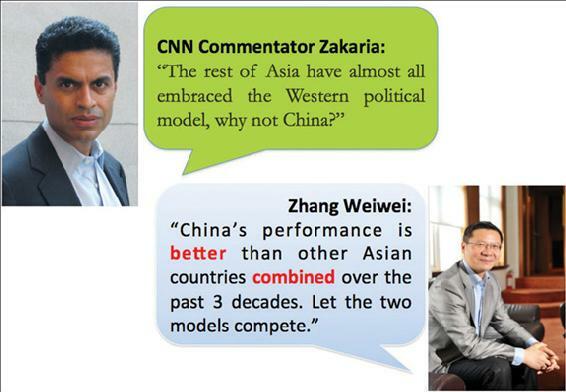 The other is geopolitical: China has geopolitical intentions, to create this new sphere of influence. And in honesty, I must say, yes, China has indeed excessive industrial capacity, so this argument stands. China wants to export its excessive capacity. And given the size of this project—it will cover 4.4 billion people along the routes—of course it will have geopolitical and geo-economic fallout. No doubt about this. But, I think if you only confine yourself to these two considerations, you miss a lot of far more important implications of this initiative. 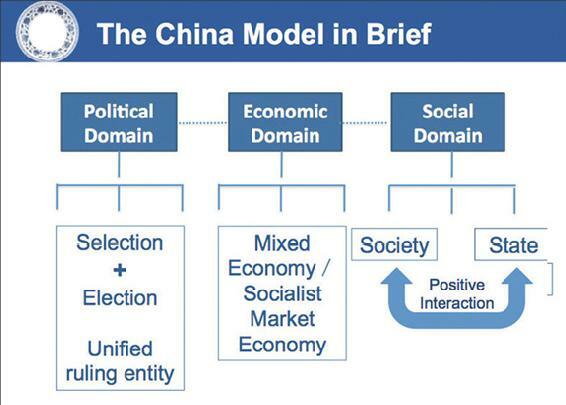 The China model has one feature better than the Western model, which is, it can plan for the future. It really plans for the next and next-after-that generations, for the next fifty to one hundred years. I will explain how the China model operates in this whole initiative. First, this is called, “people’s livelihood first.” We all know, at this moment of history, a lot of countries—European countries included—are experiencing a de-globalization. People are not happy with globalization. China is one of the very few countries that has, indeed, benefitted from globalization. You may say that China is the largest beneficiary from globalization. Why so? What’s the Chinese secret? Actually, it’s very simple: Because China defines globalization only as economic globalization, not as political globalization—that’s the key difference. Because, over the past twenty or so years, globalization was actually what’s called “neoliberal globalization.” It’s about privatization; that’s already political. It’s about democratization—that’s very political. In other words, the Americans not only want to impose economic liberalization, but also their political model worldwide. That’s why you have this “Arab Spring,” you have the color revolutions, you have the fall of the Soviet Union, fall of the East, the Berlin Wall, etc. Good or bad, but China said, “for us, globalization is only economic. Politically, no.” That’s the key difference. So with this kind of approach, China has become one of the largest beneficiaries of globalization. And why economic globalization? Because behind this is Chinese logic, one of the key features of the China model: “the people’s livelihood first,” is the guiding philosophy. What does it mean? It means whatever you do—economic reform, social reform, or political reform—you should not allow the political machine or the state structure to operate in vain or become a chatting shop. No! It has to do something concrete, tangible for people’s lives. It could be material; it could be more than material, but it has to boil down to something concrete, for the people. And thus, “The people’s livelihood first.” It reminds me of the famous line from Bill Clinton, when he said, “It’s the economy, stupid.” He advised those politicians who wanted to become prime minister or President, “Pay attention to economic performance.” So China has all along focused on this, trying to improve people’s living standards, rather than chanting empty slogans. The second part, again, of the China model’s philosophy, is “seeking truth from facts.” That’s the famous line from Deng Xiaoping, China’s late leader. He said, we should seek truth from facts, not from dogmas, whether it’s from communist dogma or from capitalist dogma; whether it’s East dogma or West dogma. East dogma is a utopian outlook; Western dogma is about democracy—the markets represent the best, and the rest is nonsense. So Deng said we should try our own approach, because it’s Chinese-style socialism. In the end, it has worked. Then you have this “opening up at home and abroad.” In the Belt and Road Initiative, it becomes what we call “connectivity.” Connectivity at the policy level, at the infrastructure level, in the trade level, at customs levels. And I will try to introduce another concept: It’s called “vertical connectivity.” I mentioned “horizontal connectivity,” especially infrastructural links between nations. At the vertical level it’s also interesting: You have the underground pipelines for oil, for natural gas; you have highway construction, bullet trains, or normal trains, sea links, air links—it’s already a bit vertical. What’s more important now, is China is also putting forward cooperation in the satellite business. And then, what’s more interesting has to do with the Europeans, what we call the Beidou system, which is China’s GPS system. And unfortunately, the Europeans missed an opportunity, because originally, China planned to do this project in cooperation with the European Union. We signed a strategic agreement: for Europe you have the Galileo program; China has the Beidou program. And yet, the EU has a lot of suspicion about China, whether we are going to steal European technologies, or whatever. [laughs] So in the end, the partnership with the European countries for this GPS system broke up; it didn’t work. So, China in the end has done it alone. Now, China is way ahead of Europe. So China has its own GPS system for the Belt and Road countries; by next year, 2018, it will cover all Belt and Road countries, and by the year 2020, in three years from now, it will cover the whole world; so it will be an alternative to the GPS system. In China we use this already. And then, more important, in the China model we have a relatively strong state, but I mentioned the historical legacies from China’s long history as a civilizational state. It’s also relatively neutral, and relatively disinterested. In the Chinese model, the central government plays a central role, because you have the different regions in China, and they also have their own interests. The central government must remain relatively neutral so that they can take care of overall interests. I’ll mention again, China is not a small country. I made a rough calculation: in Europe each country is roughly 14 million people on average, per nation, per county. China is 1.4 billion people. So China is one hundred times the size of the average European state. As a result, when we look at globalization up to now, what many countries, especially developing countries are concerned with about the existing international institutions—with the IMF/World Bank, WTO, you name it—they are, from a non-Western countries’ point of view, biased toward the West, rather than toward the developing countries. As a result, China said, let’s do something more neutral—and we tried the AIIB, the Asian Infrastructure Investment Bank, and the Silk Road Fund, etc. So these are ideas which originated from China, backed with Chinese money and other money. This is important. Another interesting phenomenon—many Europeans asked, “Can it be successful?” We met some scholars yesterday, who said, “You do not have a road map.” Europeans believe that you must have clear guidelines, a clear road map, and clear rules to go by, and then we can do it. Otherwise, we have suspicions, reservations. 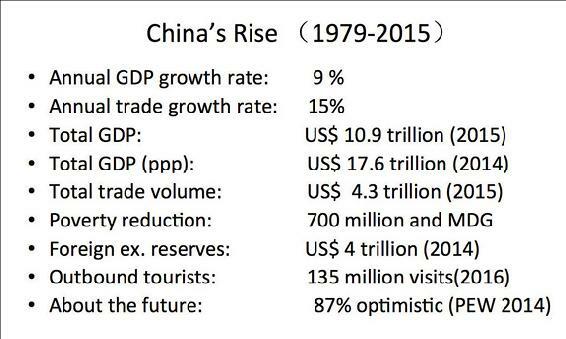 But the Chinese approach, if you look at the four decades of change since 1978, is different. We start “not with a road map, we start with a compass.” We just know the orientation, the direction. And Deng Xiaoping said, the orientations are clear: first, improving people’s living standards, and second, a more market-oriented economy. So, market orientation, and people’s livelihood, are the two orientations. And under this orientation, you encourage all kinds of experiments, and the central government will say, “this experiment is great, let’s do it, extend it nationwide. That experiment is not successful, we should stop it.” So that’s the overall approach. Most probably a road map will emerge in due course. Not now, perhaps ten years from now for the Belt and Road Initiative. So now there are some interesting developments all the time. And then, “building bridges between the old and the new.” This is also a very important feature of how the China model operates. For instance, in the process of China’s change over the past four decades, the reforms of the state sector came much later; we have kept the state sector intact, but we created a private sector from scratch, and then we tried to build a bridge between the state sector and the private sector, and let them compete with each other. And the state sector has to reform itself, and then become partners. That’s the overall approach. So in the Belt and Road Initiative, the same thing is happening. You have the existing arrangement—like in Russia, they have what’s called the Eurasian Economic Union. China said, “You stay with that, and we’ll build a bridge between the BRI and your plan.” Same with Kazakhstan: They have what’s called a Shining Road and we said, “Stay with that, and we’ll build a bridge between the two,” so the two sides can cooperate. And then, we have the great new economy, new drivers. So the Chinese model has this: If you ask a Chinese official how to develop an economy, he will study with you what will be the possible new drivers for the economy. Then, let’s do it together, developing the new drivers. Last year, in Hangzhou, we hosted the G-20 summit. Why the choice of Hangzhou? Because Hangzhou is the headquarters of Alibaba and other large companies—extremely dynamic. It’s the first Chinese city in which you can survive without cash, without credit cards. You can buy a bottle of water with your mobile phone—it’s very easy. So the new economy shows the road. 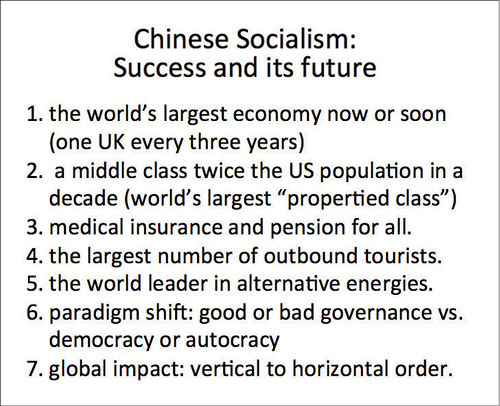 And my last slide is a projection about China’s future, or Chinese socialism. China will become the world’s largest economy in ten years—that’s by official exchange rates. If it’s by purchasing power parity, China is already the largest economy. And China now produces the size of one U.K. economy, with its extra GDP, created every three years. And China’s middle class will be twice the U.S. population in a decade. Today, China’s middle class is about 300 million. So ten years from now, China will have a middle class, by my estimate, of at least 600 million, or twice the U.S. population. For one thing, China has now already produced the world’s largest—I don’t like the word—“propertied class.” All people have properties. In the cities it’s 85%, and in the countryside it’s one hundred percent. And I just checked the latest data: The average room surface size is forty square meters, which is slightly larger than in Germany. It’s unbelievable; it just took four decades. In Shanghai, when I was a boy, the average space for an individual was four square meters, now it’s ten times bigger. It’s unbelievable. Of course, medical insurance for all, and pensions for all: China achieved that. When you look at the U.S. medical care reform, it has almost lasted for one hundred years, and is not achieved, but China has done this within five years. And of course, the level of protection differs from region to region, but basic insurance, and pensions for all has been achieved. Also China will produce more tourists, as is the case now and in the future. And China now is the world leader in alternative energies, renewable energies. So eventually it will have this kind of impact—we are to witness a paradigm shift from democracy versus dictatorship, to good governance or bad governance—and good governance can take the form of the Western political systems, but it also can take the form of the non-Western political systems. Likewise, bad governance can take the form of Western political systems, and can take the form of non-Western political systems. And the global impact will be enormous. I think we have a vertical order today, in which the West, especially the United States, is above the rest, in terms of wealth, in terms of ideas. But this order will become more horizontal. So the rest, especially China, will be on a par with the West in terms of both wealth and ideas. The world will thus be indeed very different. And many thanks! Thank you very much.